Congenital orbital teratoma is a rare condition which presents as marked proptosis of eyeball in a newborn. It is rapidly progressive with secondary damage to eyeball due to pressure effect. This case presented by us is of interest due to radiological features and rarity of this tumor extending into posterior fossa. A 12-months-old child was brought to us with gradually progressive protruding mass in right orbital region since 8 months. Parents had noticed protrusion in right eye at the age of 4 months. Child was full-term normal home delivery. Child was born of a non-consanguineous marriage and there was no history of similar complaint in other sibling. On examination there was gross proptosis of right eyeball with everted palpebral conjunctiva and widened palpebral fissure. There was punctate bleeding from the exposed mucosa. There was no vision in right eye with exposure keratopathy. X-ray skull, CT Brain with contrast, and MRI Brain with orbit was suggestive of enlargement of superior orbital fissure with erosion of superior orbital margin. MRI was suggestive of large heterogeneous mass containing both solid and cystic components extending through the enlarged superior orbital fissure along the lateral wall of cavernous sinus into middle cranial fossa and then into posterior fossa and compressing the brainstem [Figure 1] and [Figure 2]. It was pushing the eyeball downwards and outwards, with compression of the temporal lobe. 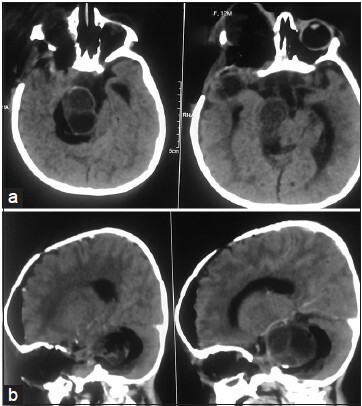 Patient was operated; initially exentration of eyeball by ophthalmologist followed with right pterional craniotomy and complete extradural approach, tracing the tumor from superior orbital fissure to posterior fossa along the lateral wall of cavernous sinus. 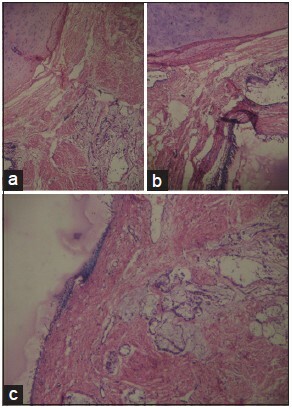 Tumor consisted of multiple cystic spaces with few solid areas, cartilage, and muscle tissue [Figure 3]. Tumor was vascular. Part of tumor which was adherent to brain stem was left behind. Patient recovered well and was discharged. Patient is regularly following up with us. Microscopically tumor showed components of all three germ layers. Numerous mucus glands were seen which is a endodermal component, catilagenous tissue was seen representing the mesodermal part and lining of squamous epithelium representing ectoderm. There was no evidence of malignant change on histology. Our case presents a unique challenge as orbital teratoma extending to posterior fossa is extremely rare, not reported to the best of our knowledge. Interestingly a conservative approach in leaving behind part adherent to brainstem has helped in patient recovering well and as it is a benign tumor regrowth is still not seen on follow-up. 1. Si HC, Young BH, Lee TJ. A case of congenital orbital teratoma. Kor J Opthalmol 1987;1:139-44. 2. Lacey NA, McWilliams S, Jan W, Bingham JB. Case of the month: Congenital unilateral proptosis. Br J Radiol 2002;75:191-2.